This picture of the nearby spiral galaxy NGC 6744, which could be the Milky Way's twin, was taken at the European Southern Observatory's La Silla Observatory in Chile. Almost like a postcard from across the universe, astronomers have photographed a spiral galaxy that could be a twin of our own Milky Way. 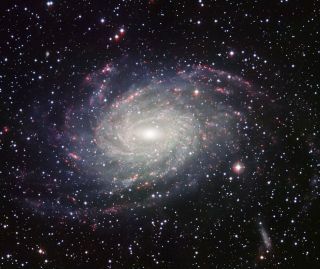 The distant galaxy, called NGC 6744, was imaged by the Wide Field Imager on the MPG/ESO 2.2-metre telescope at the European Southern Observatory's La Silla Observatory in Chile. The pinwheel lies 30 million light-years away in the southern constellation of Pavo (The Peacock). "If we had the technology to escape the Milky Way and could look down on it from intergalactic space, this view is close to the one we would see — striking spiral arms wrapping around a dense, elongated nucleus and a dusty disc," according to an ESO statement. "There is even a distorted companion galaxy — NGC 6744A, seen here as a smudge to the lower right of NGC 6744, which is reminiscent of one of the Milky Way’s neighboring Magellanic Clouds." The main difference between NGC 6744 and the Milky Way is the two galaxies' size. While our galaxy is roughly 100,000 light-years across, our "twin" galaxy extends to almost twice that diameter, researchers said. The photogenic object is one of the largest and nearest spiral galaxies to Earth. It's about as bright as 60 billion suns, and its light spreads across a large area in the sky — about two-thirds the width of the full moon — making the galaxy visible as a hazy glow through a small telescope. The reddish spots along the spiral arms in NGC 6744 represent regions where new stars are being born. The picture was created by combining four exposures taken through different filters that collected blue, yellow-green and red light and the glow coming from hydrogen gas. These are shown in the new picture as blue, green, orange and red, respectively.